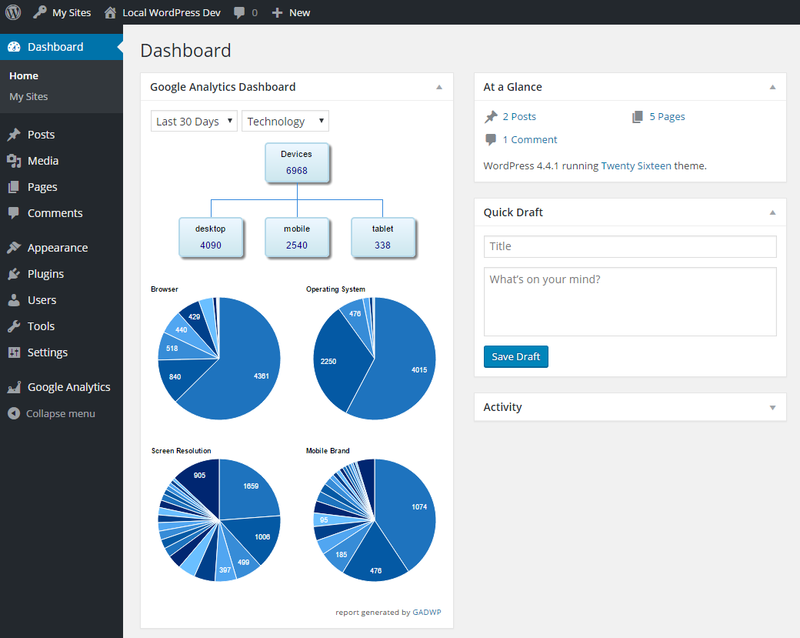 In December we had a major release of Google Analytics Dashboard for WP. The 4.9 release has focused on re-writing the dashboard widget from scratch and implementing some of the feature requests and enhancement suggestions we had in the past. Even if your ideas haven’t reached the latest release, we’re constantly looking over them and the most popular ideas will always find their path into a new version. New suggestions, ideas and contributions are always welcome! Among the many improvements we had so far in the 4.9 release, I’ll highlight the most important ones below. Say goodbye to annoying page refreshes! Yes, that’s right! There are no more page refreshes when you switch between various reports and date intervals in your dashboard screen. After switching the report, a blue bar will show the loading status and the contents of the widget will be populated with the newly requested report. Pie Charts are now displaying the total number of sessions for each pie slice, in addition to percentages displayed as tooltips. All errors and invalid responses generated by an ajax request are now captured and displayed in the Errors & Debug screen. We’ve added cookieName, cookieDomain and cookieExpires options to make cookie customization easier. API Key option was removed, because is not needed anymore. You can now use your own API project credentials without entering an API Key.